The rosh yeshiva we met with yesterday asked me if I still had my parents. I didn't understand, I guess, and probably said "what?" or something dumb, so he said, "They're both still alive?" And I said yes. And then, well, "no." And then, "well, one is." Sometimes, I am very dumb. My mother says this picture makes her look like the Pillsbury doughboy. 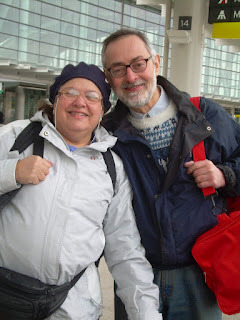 in this picture, at the airport on their way to Israel. January 2007. He sure doesn't look like a guy with less than two years to live, but I guess a lot of people don't. The interview with the rosh yeshiva went pretty well, otherwise. The yeshiva itself apparently used to be a bit bigger and is now a lot smaller, which gives it a bit of a creepy "ghost-town" ambience. Lots of wide, empty corridors and classrooms closed up and silent. Okay, there was also a small mostly washed-away puddle of vomit on the front steps. Am I allowed to let that colour my perceptions? Gaaah. Otherwise, actually, it actually did go quite well. He did a lot of speaking to Yerachmiel Meir, and a lot of explaining about the curriculum and so on. YM brought a gemara, but the rosh yeshiva did not ask him to read; apparently, they do that at the second interview, after you have applied and they're seriously considering you. He did a lot of explaining about how they have seen every possible family situation and nothing could possibly shock or surprise them - they've seen geirim and baalei teshuva, etc., and what really matters is simply the boy: his attitude towards learning and whether he can handle what the rosh yeshiva continually referred to as an ultra-Orthodox (gack) chareidi curriculum, hashkafa and lifestyle (ok, the three are supposed to go hand-in-hand, but of course, at many schools they do not). I liked the fact that he was VERY clear about the goals and outlook of the school. As a BT (baalas teshuva), on some level, I want this very much for YM, never having had it myself. Yet, I also do think he'd thrive and mature immeasurably in an environment with that kind of structure. But, as I said when his present rosh yeshiva called to strongly push for this yeshiva, I don't want to put him somewhere which is not a good fit and then have to switch him later. I would love for him to be settled into one spot for the duration, for so many reasons. He needs stability, and would greatly benefit from being a multi-year student in a normal yeshiva setting. His rosh yeshiva kept talking about his abilities and how brilliant YM is, which makes me cringe, because I've always said that smart kids are a dime a dozen - what I want are NICE kids. Plus, every educator thinks they're the first to tell me what incredible potential he has, how brilliant he is. His daycare principal actually came, towards the end of our time there, and said she had taught many MANY kids over the years and never had a single one as bright as YM. Great... I guess what I really want is a nice, average kid. It both embarrasses and frightens me to be told of his great potential. I don't want to screw him up. I believe he is here on this earth to learn Torah, but I also fear that if I push too hard, or if he's in the wrong place to do it, he's going to hate it and rebel and not want anything to do with it. Yet I see how his mind expands, how excited he is when he's immersed in Torah. A bright child is not always a gift to his parents.